Many countries that are outside of the United States have a value-added tax (VAT) and rely on the invoice document as a key mechanism for VAT auditing and fraud prevention. IBM® Sterling e-Invoicing automates buyer and supplier electronic invoice processes in compliance with country-specific tax regulations. This compliance reduces corporate risk and exposure while improving operational efficiencies. 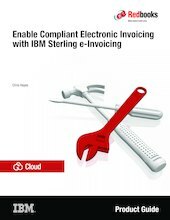 This IBM Redbooks® Product Guide describes the key requirements and challenges of global e-invoicing and the ways IBM Sterling e-Invoicing enables customers to address these challenges. This publication explains the business value of the product, provides an overview and high-level architecture of the product, and includes a usage scenario.